Today I was inspired by there two challenges since I found the print out of an Iowa farm that fit the bill. I used a A2 card base in white then a mat in black to place the drawing for the winter picture of a Iowa barn covered in snow. 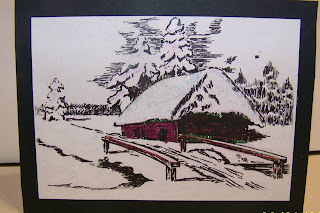 I used markers to color the barn in maroon and black to do the shadows then Crystal Stickles for the white snow. Send A Smile 4 Kids Challenge Winter Fun 4 Kids that cards can be holiday or any winter teamed cards. The Play Date Cafe 'Color Splash' Challenge it's simply...Black & White with a 'Splash' and this time, it's a splash of MAROON. This is gorgeous, Sherry. Love the sparkly look of your snow covered countryside. You did a wonderful job with your splash of Maroon...it's perfect!